In Voltaire’s novel Candide (1759), the question is asked, how can happiness be found? Candide leaves the comfort of his home and his sheltered life to embark upon a journey under the tutelage of Dr Pangloss, where he witnesses a world of evil and suffering, finding no rational explanation for such unhappiness. Candide eventually returns home where he finds some peace in his house and his own garden, surrounded by those he knows. Candide concludes that in order to find some happiness, “we must cultivate our own garden”. Metaphorically and literally, if you pull back from the disillusionments of the wider world and focus on what you are doing in the most localised sense of your life, and work hard to contribute to that, then happiness can be found. The philosophy chimes in with a current, general move towards contemplating the smaller things in our lives, and concentrating on those around us, and getting these things right before attempting to tackle the larger problems and the wider world. Stand in your own garden and look around you – do you have neighbours? The chances are that unless you live in a remote, rural area, you will, and with more and more of us now living in densely populated urban areas, then you might have many. 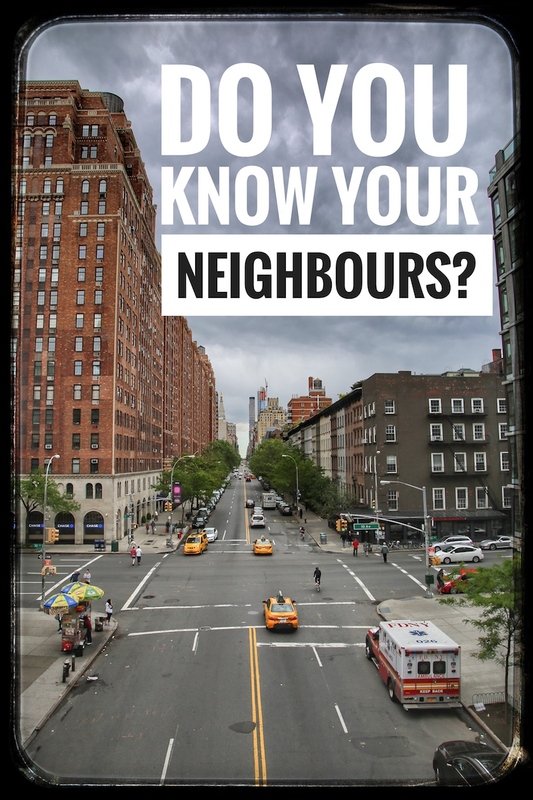 How well do you know your neighbours? Could you know them better? Neighbours – someone to have a quick chat with, or a cup of tea, discuss the gardening with, help you out with a lift or a spare key. Neighbours can get together to sort out a local problem or club together to help another who is having a hard time. Neighbours have one thing in common – they have chosen to live – or ended up living – in the same area. It doesn’t matter if they are young or old, a QC or a tyre fitter – they can all get along, bonded by a common purpose. And that can be hugely beneficial and comforting. Someone handy can help out with a small repair; someone with a great legal brain can offer some useful advice, someone can water your plants, give you some of their garden produce, take in a delivery for you – offer support in a most elemental and consistent way. My neighbours are hugely varied and in a small terrace of houses and flats, range in age from a few months to 95. Many of the neighbours have lived here for a long time and we all know each other quite well. My next door neighbour has a neighbours’ lunch from time to time and other neighbours, a neighbours’ Christmas get-together. My friends who live nearby have an annual party where they invite the whole street over for the evening. After all such events, the neighbours report a good sense of wellbeing and satisfaction in knowing their neighbours better and finding they have more in common than they thought. But my favourite neighbours’ activity is the local pub choir. Every Wednesday a group of us who live nearby and loosely based around the local pub, grab a glass of Guinness and practice our songs in the rehearsal rooms. Twice a year we put on a performance in the pub. It’s a great way to release the tensions of the week (and that’s not wholly down to the Guinness, though that helps) and to meet a group of people you might not ordinarily come into contact with. There are people from all walks of life and a great sense of camaraderie has developed. We all look forward to it. The value of neighbours – and doing things with your neighbours – cannot be underestimated. Many local councils now run programmes where they aim to put young people in touch with older people in their neighbourhood to ease isolation – a growing problem for many. The idea of having a neighbours’ day has been around for a while now in many countries. Many studies report a greater sense of wellbeing for those who feel they belong in neighbourhood communities.